Egypt has criminalised sexual harassment for the first time, in a move that campaigners say is just the first step towards ending an endemic problem. Egypt’s outgoing president, Adly Mansour, issued a decree that categorised sexual harassment as a crime punishable by a minimum six-month jail term and a fine worth 3,000 Egyptian pounds – with increased penalties for employers and repeat offenders. UN research from 2013 suggested that 99.3% of Egyptian women had experienced sexual harassment – but it is often the victims who are blamed for their experience, rather than the harassers. Campaigners welcomed the law, but warned that it remained to be seen whether it would be enforced by police. One woman who took her harasser to court last year – and successfully won a rare conviction on assault charges – told the Guardian at the time that the police had been one of the biggest obstacles to the case. “You think I’m going to lock up every man who beats someone in the street?” one official allegedly told her after she first tried to file the charges. “That’s how lightly they took it,” she added. One senior policeman interviewed by the Guardian, Colonel Ahmed el-Dahaby, promised police would take the law seriously. But he also warned that the problem lay not with the police, but with society. But another Cairo-based policeman said police were part of the problem, admitting he still partly blamed women for the way they were treated. “The fault is a shared one between the guy and the girl – the girls because of the way they dress,” the policeman said, on condition of anonymity. It is an attitude often heard in Egypt – most recently from the president of Cairo university, Dr Gaber Nasser. Confronted by footage of a female student being harassed by a mob while crossing his campus in March, Nasser initially said both harasser and harassed should share the blame and a punishment. “We don’t require a uniform here but clothes should be within the tradition of our society,” he claimed, before backtracking amid a media storm that helped chivvy lawmakers into introducing the new legislation. 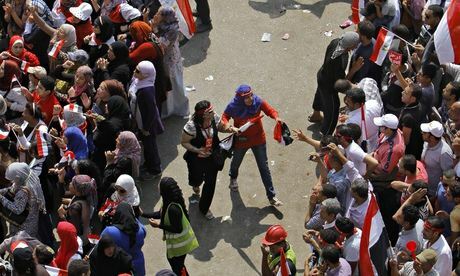 Soraya Bahgat, the co-founder of Tahrir Bodyguards, a group that rescues women from mob sexual assaults during protests, called the amendment “a great first step”. But she warned that it still left many grey areas, including uncertainty over how victims of mob attacks might seek legal recourse – particularly if they are expected to bring their assailants to the police in order to lodge a complaint. Posted on 6th June 2014 by newsafrica. This entry was posted in Africa, Arab Spring, Democracy, Egypt, Human Rights Violations, Islam, Leadership, Religion, United Nations and tagged Cairo, Egypt, Egyptian pound, Guardian, Harassment, Hosni Mubarak, Sexual harassment, Tahrir Square. Bookmark the permalink. ones point out coatings filming our team but hang out, utters Markle. We subsequent this kind of. Ended up being this entrance internet site from Pandora bracelets to find better new music websites.